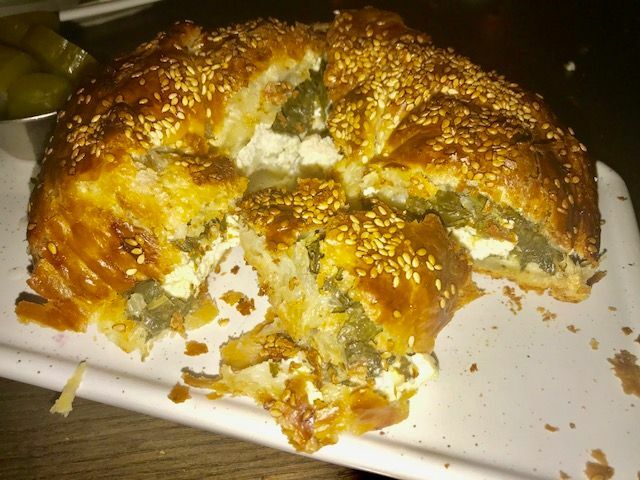 Inside the large flaky boureka you’ll find spinach and cheese or sun dried tomatoes and cheese. Gazala's interior is bright and lively. I reserve expecting the usual fare: Hummus, rolled grape leaves, baba ganoush, kebabs. 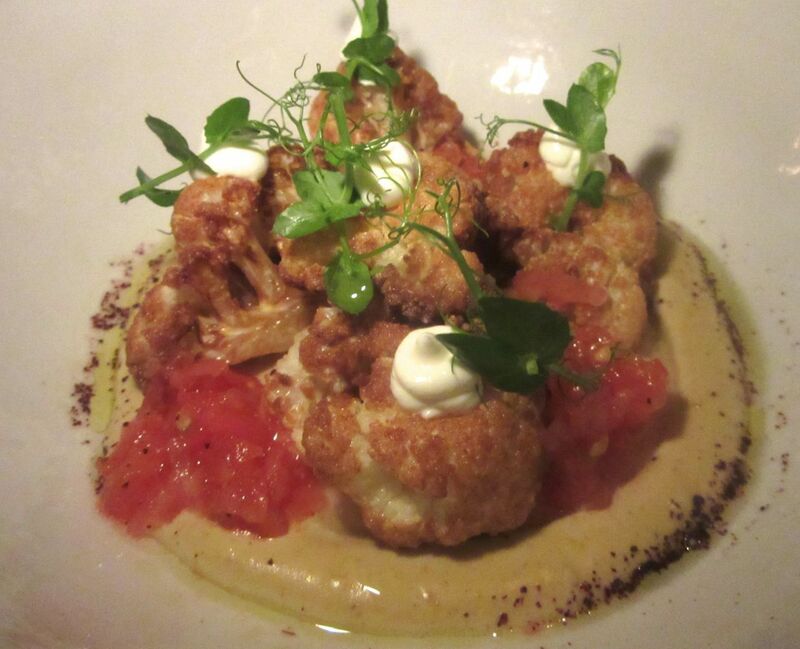 But nothing is usual about the remarkable food coming out of the kitchen at Gazala’s. It just sounds familiar. 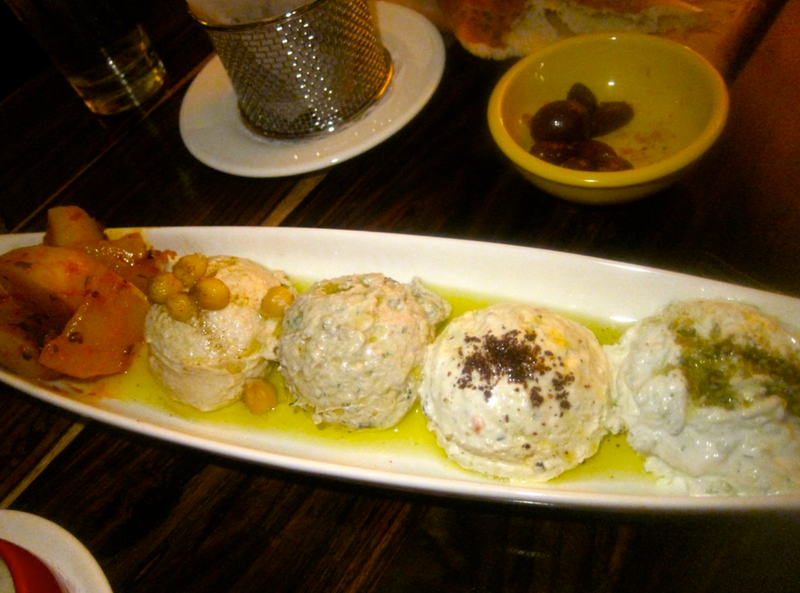 That first evening my friends agree I should order Gazala’s $38 platter so we can get a good sampling of cold and hot meze in one fell swoop. Enter to a tight little corner in front of the bar and convince a dubious greeter that you really have reserved. 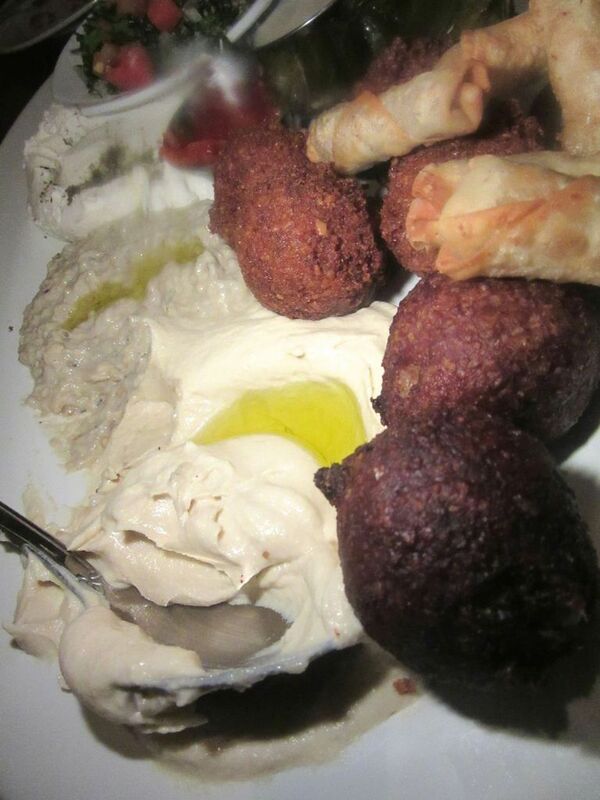 On a first visit, I ordered the $38 Gazala’s platter thinking we could taste many hot and cold mezes all at once. I tear off a rag of the house bread -- it comes collapsed and wrinkled in a basket like a bed sheet out of the dryer. 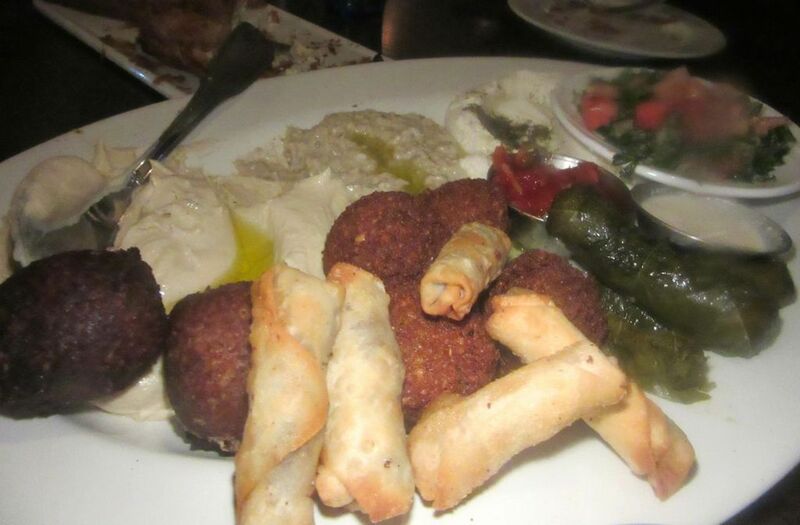 I try the spreads smeared on the sampler plate, the rolled grape leaves, falafel and crispy hand-rolled potato, meat and cheese cigars. But what really gives all of us a thrill are puffy pastry rounds, bourekas filled with cheese and zatar or spinach and cheese that are not even listed on the menu. “They are specials today,” says the server. 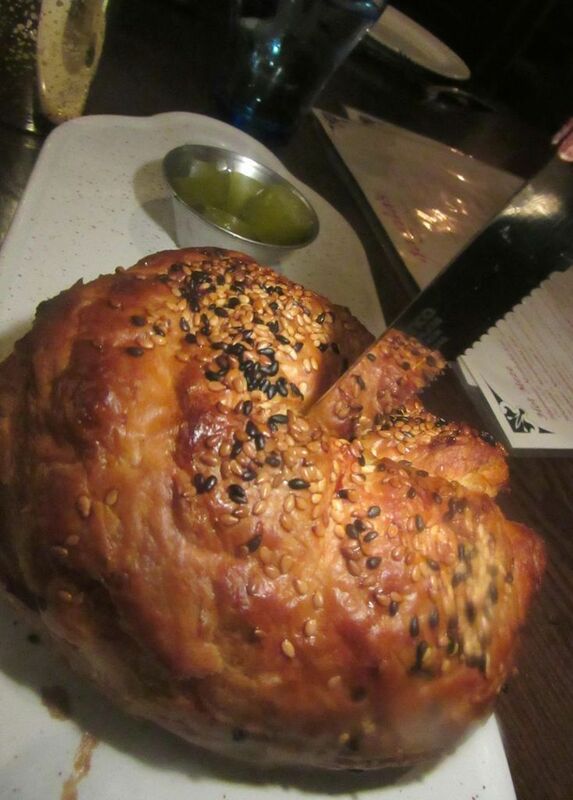 The boureka comes to the table warm and beautiful from the oven with a little dish of olives and pickles. It can be quiet at 7:30 but by nine when it’s fiull, some people aren't comfortable unless they’re yelling. This photo is posed. When Gazala stops by our table in the middle of service, I can see she’s been cooking. When Gazala emerges from the kitchen looking exhausted and stops by our table she doesn’t have the Middle Eastern look I expect, the dark hair and golden skin. With her pale skin and light complexion, she could be Russian. She speaks with an unidentifiable accent. 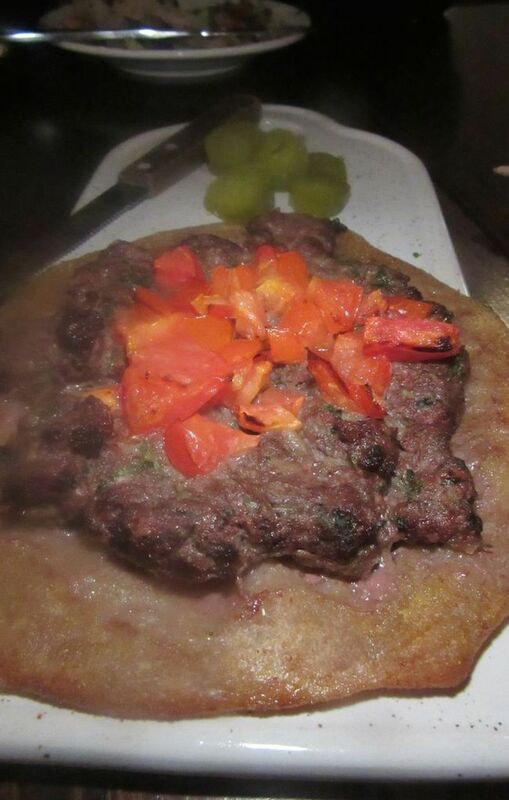 The open meat pie with tomato (listed simply as meat pie 10.5 meaning $10.50) looks like a miniature pizza. Here how it looks when you cut the spinach and cheese bourecka in six pieces for sharing. The Druze are an Arabic-speaking ethnoreligious group originating in Western Asia who self-identify as Unitarians, I learn from Wikipedia. There are 600,000 in Syria, 200,000 in Lebanon, 150,000 in Israel, 20,000 each in Canada and Australia and 14,000 in Germany. “They are very peaceful people and follow the ways of the country they live in,” Gazala adds. 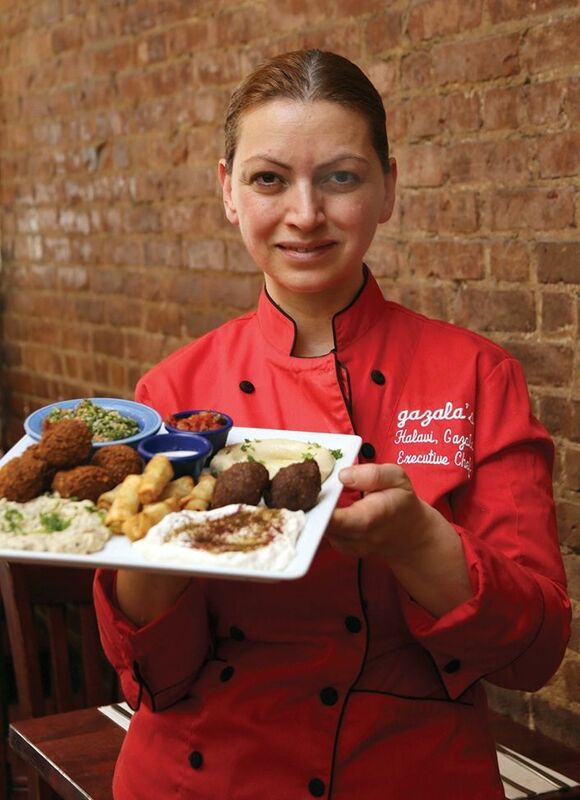 She and her husband -- Druze, indeed -- came to New York from Israel where her family owns a restaurant and her grandmother ran a spice shop. So many dishes on a table for two. The leftovers of two boureckas will be great warmed for dinner tomorrow. Mankosa bread topped with zatar and middle eastern spices is perfect for spreading with almost any cheese. 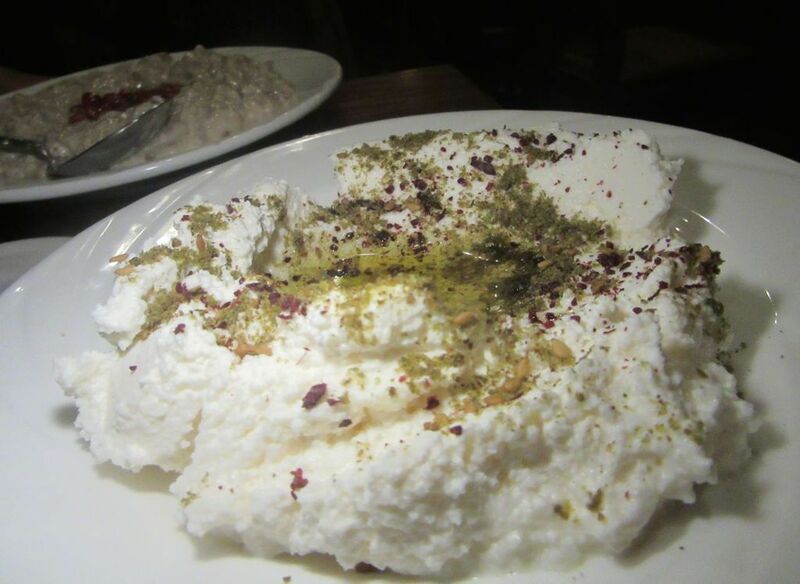 The lebane is made with homemade yogurt cooked the texture of soft cheese to spread on saag bread. At the end I manage to taste a chunk of toughish ground meat kebab in a glorious tomato sauce. Choose one entrée I’ve never tasted I say. 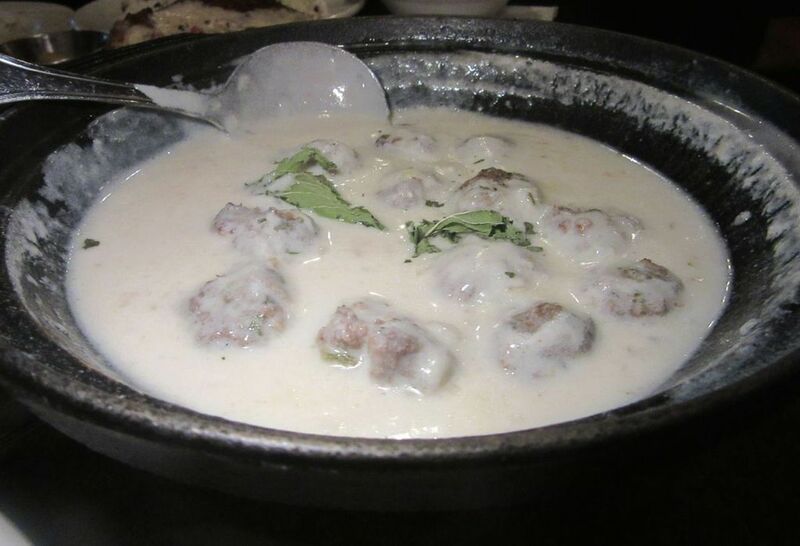 Gazala sends out bulgar and meatballs in a homemade yogurt sauce. A server passing by overhears us and writes the name “kebab halabi” on a piece of paper for me. 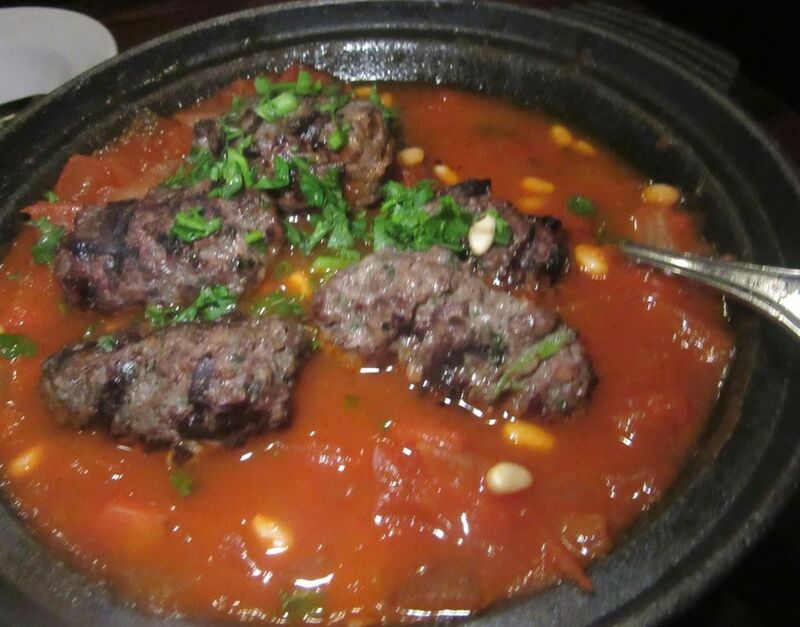 Tough grilled lamb and beef kebabs float in an ambrosial tomato sauce sprinkled with roasted pine nuts. 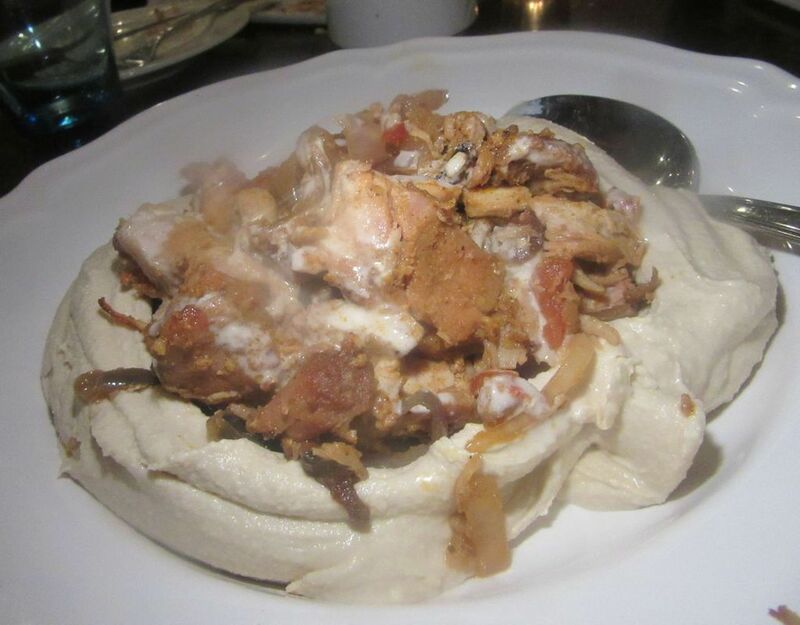 I can barely take more than a taste after large chunks of boureka, and the previous mystery dish, bulgur and meat balls bobbing in yogurt sauce. Gazala makes her own yogurt, of course. 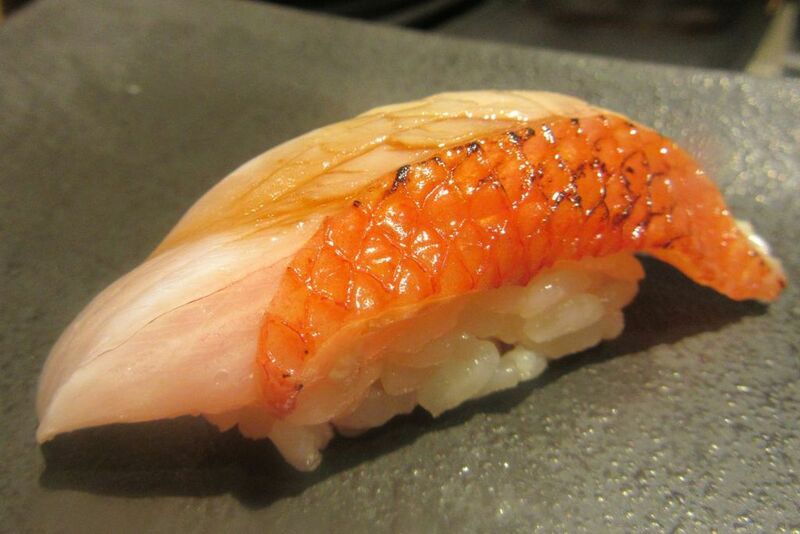 It is especially tangy because its “mother” is 11 years old. 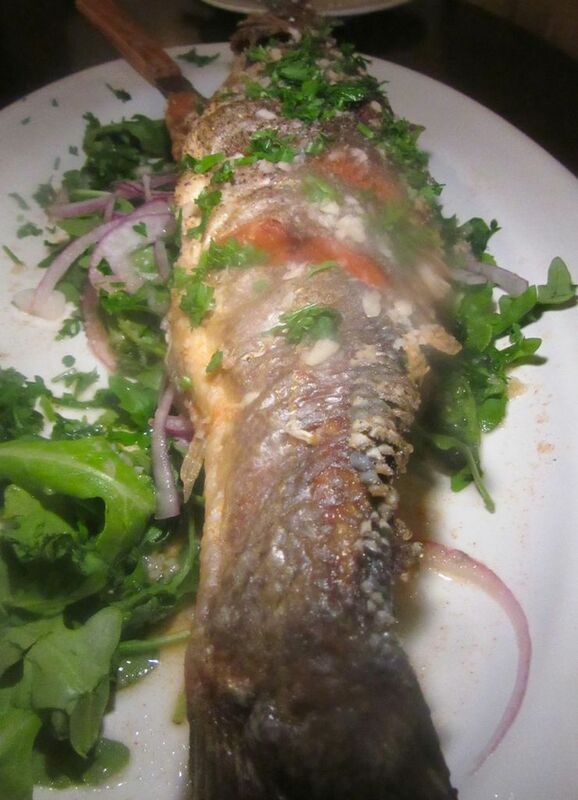 My niece Dana and her husband share a crispy whole sea bass that’s inly a tad too cooked. One evening earlier, my niece Dana and her husband Craig share a crispy sea bass, cooked just a bit too long but full of flavor. I order the lamb shank with stewed potatoes and a rain of pomegranate seeds. It’s been over cooked too and the meat falls apart with a touch of the fork. Perhaps some will enjoy that surreal tenderness; not me. The Israeli salad is a toss of tomatoes, cucumbers, parsley, red onion and mint, served with two sauces. But it’s the baking, the pies and crepes and flatbreads, that get our attention here and keep bringing me back. That night Dana feels a desperate need for greens but not necessarily the fattoush salad or the arugula greens with tomato and cucumber topped with pine nuts. 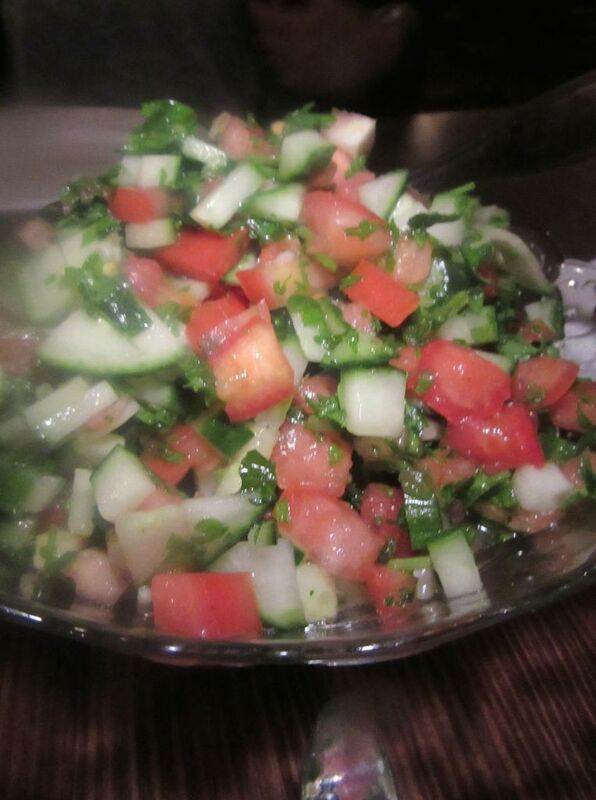 We order the Israeli chopped salad with tomato, cucumber and red onion. A duo of dressings, tahini and sumac sauces, come with. 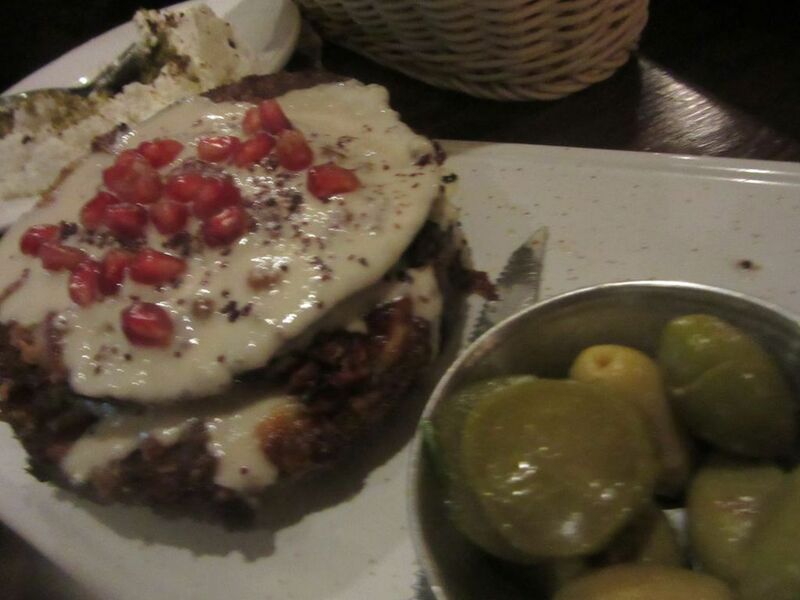 Finely chopped charred eggplant is mixed with homemade tahini sauce in the chef’s baba ganoush tower. 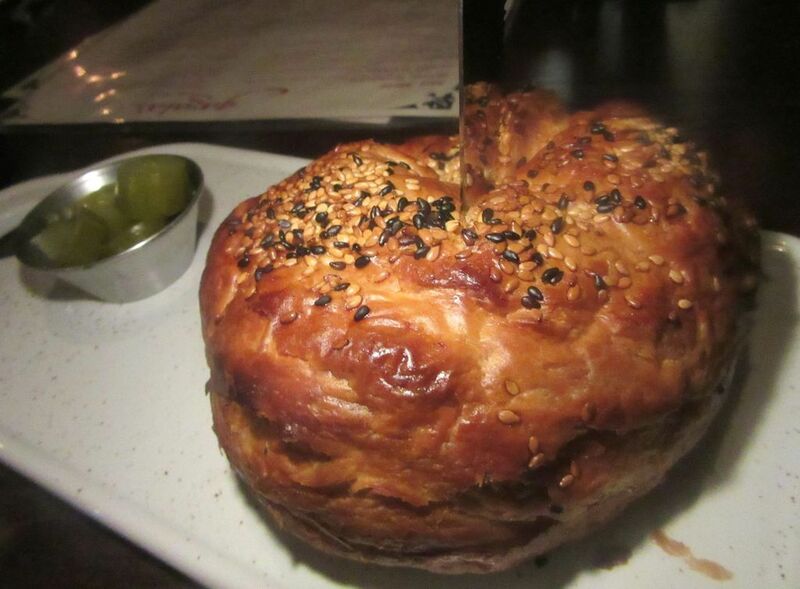 We keep discovering and rediscovering the breads and pies. Not all of them are on the menu and you have to get the server to tell you the options. 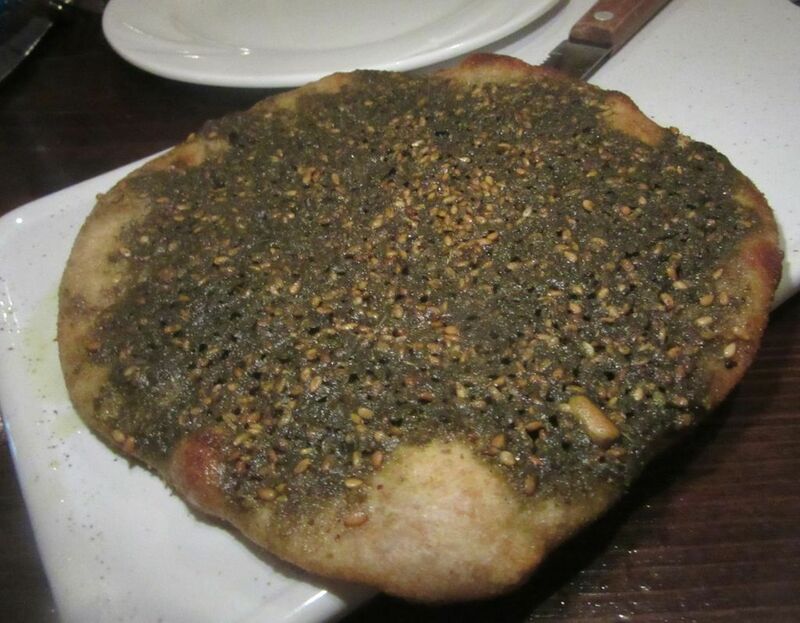 On one visit we order zatar and cheese pie because we’ve already tasted the meat pie but the waiter brings the meat pie. He seems seriously upset when we send it back and takes it to show Gazala as if it were our fault and not his. 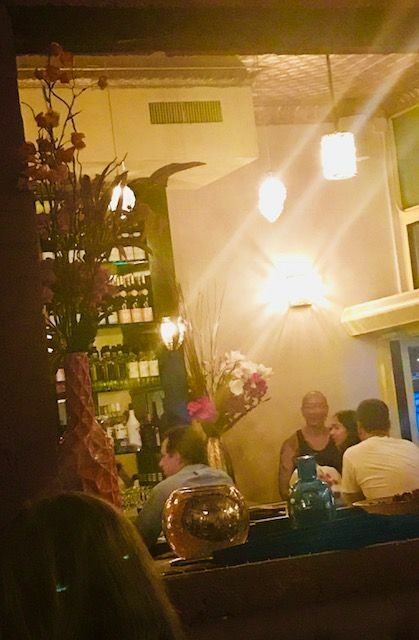 Order the whole fish, of course, if that’s what you crave -- say how you want it cooked if you’re fussy -- and get the shrimp hummus if that calls out to you or the roasted cauliflower with creamy tahini sauce and Druze herbs and spices. 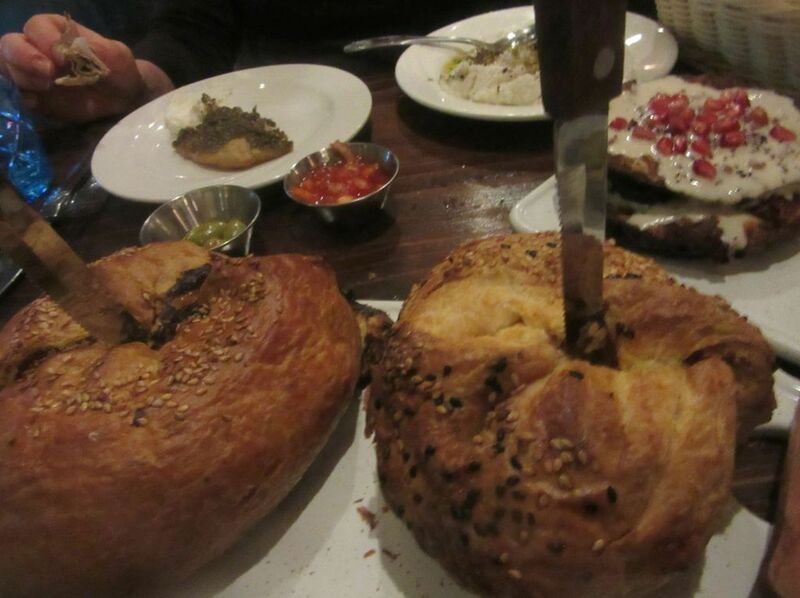 But don’t miss the bourakas and pies even though you’ve never heard of mankosha or a mahamar pastry. 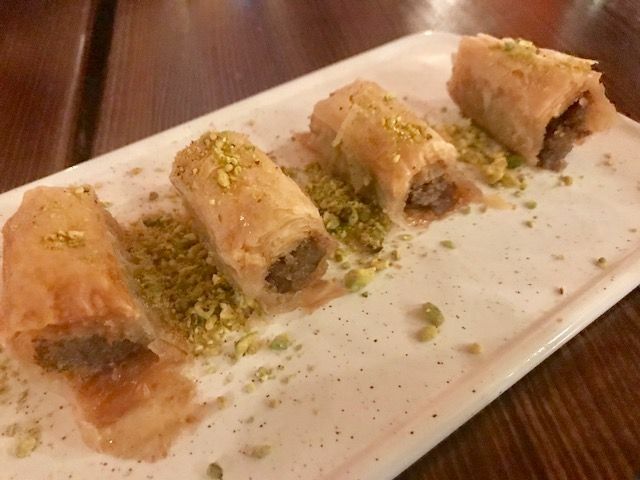 The house baklava is less sweet than this typical Arab pastry. Persuade your pals to try dessert. The baklava will be familiar and you might be pleased to find that it’s not as sweet as most are. 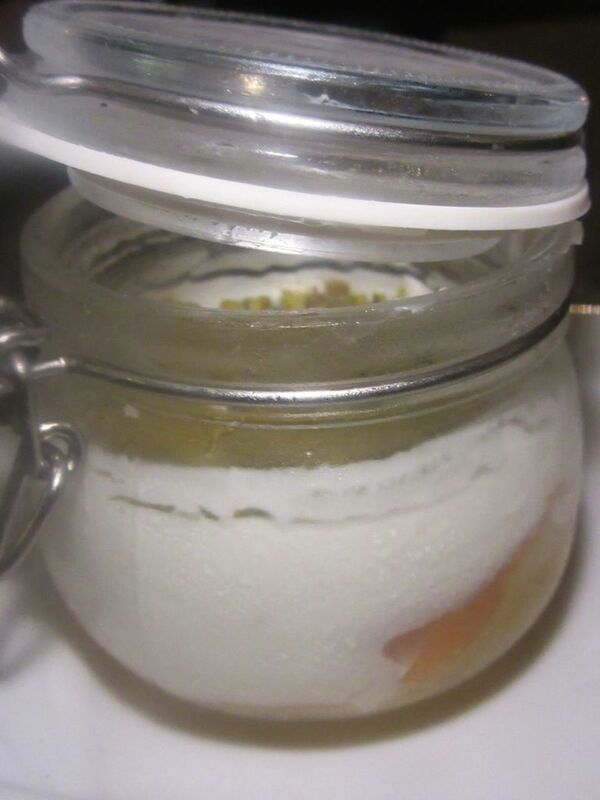 Discover the pistachio-topped osh-al-saria soaked in honey syrup with a creamy custard that comes in a canning jar. Reach your spoon down to the bottom. Osh-Al-Saria starts with sponge cake soaked in honey, topped with creamy custard, garnished with pistachios. 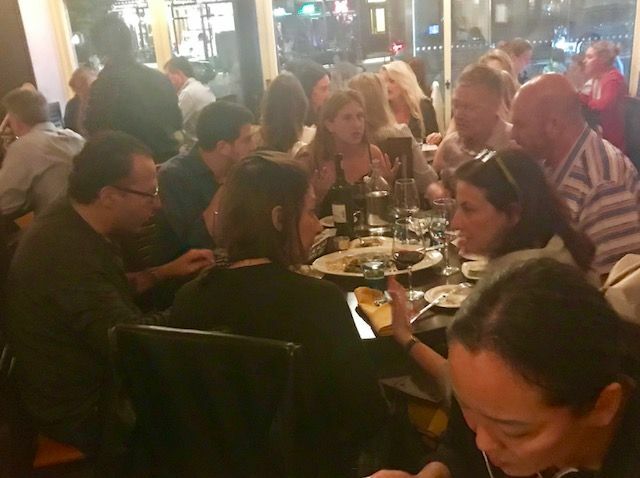 Bring your friends who think they know everything about eating in New York. Perhaps, like me, they will discover a new culture and savor dishes they never tasted before. 447 Amsterdam between 81st and 82nd Streets. 212 787 1800. Dinner Sunday through Thursday 11 am to 11 pm. Friday and Saturday 11 am to 11:30 pm.